It was a record-breaking 11th PBA major title from Belmonte, who hails from Orange, New South Wales, and his 21st overall title. It was a tense final match of the world series in Detroit, Michigan. Up against Jakob Butturff, Belmonte was in command with a 32-pin lead after six frames, but his American opponent managed six strikes in a row to close out his game, forcing the Australian to close out his tenth frame with a strike and at least a spare to win. Not surprisingly, the two-handed sensation nailed a double (two strikes) in the tenth and was met with a thunderous ovation and chants of, “Aussie, Aussie Asie! Oi, oi, oi!” from the crowd as they witnessed history at Thunderbowl Lanes. In a touching moment for Belmonte, the world championship final was live streamed at his children’s school in Australia, and during his post-match interview a video was played of the class watching the stream and erupting when they saw Belmonte throw the final strike to win. Belmonte equalled the majors record set by PBA hall of famers Earl Anthony and Pete Weber, both with ten, when he won the PBA Tournament of Champions on 10 February, but he was denied the chance to hold the record outright when he suffered a heartbreaking loss in the final of the Players Championship a week later. But that loss only delayed the inevitable for Belmonte, who has dominated the tour this season, winning his 20th PBA title, the Chameleon Championship, just days before his historic world championship victory. He is now the odds-on favourite to win his fifth PBA player of the year award in the past seven years. George Frilingos, a former Australian representative and a long-time friend of Belmonte, believes he should be recognised as one of the most successful sporting athletes Australia has produced. “Jason has not only become a world champion several times over, he has rewritten the record books at every possible level throughout his amateur career through to his professional career,” Frilingos said. “In the US he is regarded as tenpin bowling’s equivalent to the likes of Tiger Woods, Tom Brady and Michael Jordan. At 35 years old, it’s scary to think that the four-time player of the year may still have at least another ten good years left on the PBA tour. He may set records that will never be broken. 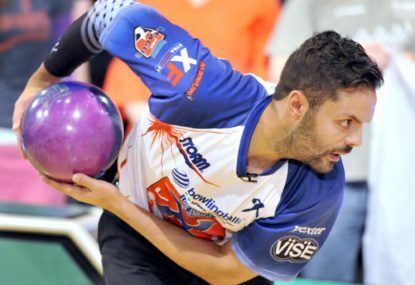 It’s unfortunate that tenpin bowling doesn’t get the same exposure in Australia as it does in the US, because Jason Belmonte certainly deserves to be mentioned among Australia’s premier sporting athletes.